There is ample evidence this book (ie Tazkirrah ur-Rashid) was published in Rashid Ahmad Gangohis lifetime, so he saw it, read it and might have even checked it. Although this is not exactly certain as there is no publication date on the book and neither does the intro indicate anything. 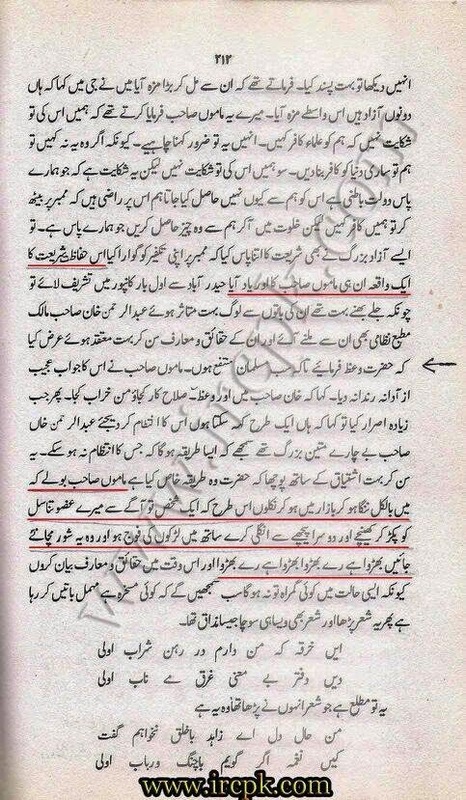 Secondly some deobandi quarters and “innocent sympathisers” may argue that Rashid Ahmad Gangohi never actually wrote this. So we answer and say this is not problematic from a number of angles. The first being his close students, murids, disciples and sympathisers compiled and penned the book and they were aware of his Aqidah and what it conformed to ie essentially what his aqidah was. secondly, these compilers are the pillars of the deobandi sect themselves and hold enormous weight so this is detrimental in itself. Thirdly this book is his memoirs ie his thoughts, what he presented to the people, how the people saw him and in what light and his general teachings. At the very least we should understand and hold this as a deobandi aqidah. One begs to ask, what was Mr Gangohi Rashid Ahmads pen doing there? What is this notion implying? We know Allaah Jallo Wa A’la rises above his throne but here we find Mr Gangohis pen. This jahmi aqidah is despicable as on one hand they claim they make ta’weel of the sifaat and here they are claiming elements divinity and this wont be the first time they have done this. Does it not suggest that Mr Gangohis pen is traversing above the Throne is meddling with core elements of divinity. We have not even begun the address the seriously grave mistakes in aqidah in this passage. Mr Sian Shah knowing the unseen and meditating. There is also a staunch and horrid smell of infallibility lurking in this passage. List of books and epistles written against ibn ‘Arabi . How many books written defending ibn arabi and how many scholars defending him vs how many refuting him? 1) “Risalah fi Zamm ibn ‘Arabi” (epistle in the blame of ibn ‘Arabi) of Abu Muzaffar Muhammad ibn ‘Umar Al-Kamili Ash-Shafi’i. 3) “An-Naseehah As-Sareehah min Qareehah Saheehah” (The clear advise from correct disposition) of ibn Al-Qastalani Ash-Shafi’i. 4) “Al-Bayan Al-Mufid fi Farq bayna Al-Ilhad wa Tawheed” (the beneficial expose in diffenriating between infedility and monotheism) of ibn Shaykh Al-Hizamiyayn al-Hanbali. 5) “Lawami’ Al-Istirshad fil Farq bayna Tawheed wal Ilhad” (The flashes of seeking guidance in differentiating between monotheism and infedility) of ibn Shaykh Al-Hizamiyayn al-Hanbali. 6) “Ash’at An-Nusus fi Hatk Astar Al-Fusus” (The rays of the texts in unveiling the veils of Al-Fusus) of ibn Shaykh Al-Hizamiyayn al-Hanbali. 14) “Bayan Hukm ma fil Fusus minal I’tiqadat Al-Mafsudah wal I’tiqadat Al-Batilah Al-Mardudah…(expose of the ruling on what is in Al-Fusus among corrupt beliefs and false and rejected beliefs…)) of ‘AbdulLateef As-Su’udi. 15) “Risalah fi At-Tahzeer min ibn ‘Arabi wa Kitabihi Al-Fusus” (epistle in warning against ibn ‘Arabi and his book Al-Fusus) of Taqiyudin As-Subki. 16) “Ar-Rad ‘ala Abateel Kitab Fusus Al-Hikam li ibn Arabi” (A refutation of the falsehood contained in the book “Fusus Al-Hikam” of ibn ‘Arabi) of Sa’d At-Taftazani. 17) Many booklets and Fatawa of Al-Bulqini on Ibn ‘Arabi. 18) Booklet of Hafiz Al-‘Iraqi of his Fatwa against ibn ‘Arabi. 20) “Tasawurat An-Nusus ‘ala Tahawurat Al-Fusus” ” (The assaults of the Texts against the excesses of “Al-Fusus”) of Shamsudin Al-‘Ayzari Ash-Shafi’i. 21) “Juzz fi Al-Man’ min Qiraah Kutub ibn ‘Arabi” (Juzz in forbiding from reading the books of ibn ‘Arabi) of ibn Al-Khayat Ash-Shafi’i. 22) “Kitab fi Bayan Fasad Madhab ibn ‘Arabi” (book in exposing the corruption of the Madhab of ibn ‘Arabi) of Ahmad An-Nashiri Ash-Shafi’i. 23) “Hashiyah ‘alal Fusus” (notes on Al-Fusus) of Ahmad Al-Ba’uni Ash-Shafi’i. 25) “Kashf Az-Zulmah ‘an Hazihi Al-Ummah” (unveiling the darkness from this ummah) of Muhammad Al-Muzi’i Ash-Shafi’i. 26) “Tahzeer An-Nabeeh wal Ghabeeh minal Iftinan bi Ibn ‘Arabi” (warning to the sagagious and idiot person from the trial with ibn ‘Arabi) of Taqiyudin Al-Fasi. 27) “Hawashi ‘alal Fusus” (notes on Al-Fusus) of As-Sayrami Al-Hanafi. 28) “Fatwa fi At-Tahzeer min ibn ‘Arabi” (Fatwa in warning against ibn ‘Arabi) of ibn Al-Jazari Ash-Shafi’i. 29) “Az-Zaree’ah ila Nusrah Ash-Sharee’ah” (The means in assisting the Sharee’ah) of ibn Al-Muqri Ash-Shafi’i. 30) “An-Naseehah” (advise) of ibn Al-Muqri Ash-Shafi’i. 31) “Al-Hujjah Ad-Damighah li Rijal Al-Fusus Az-Zaaighah” (The invalidating proof on the men of the deviated Al-Fusus) which is his poem known as “Ar-Raaiyah” of ibn Al-Muqri Ash-Shafi’i. 32) “Ar-Rad ‘ala Fusus Al-Hikam” (Refutation of Fusus Al-Hikam) of ibn Zaknun Al-Hanbali. 33) “Fadhihah Al-Mulhideen wa Nusrah Al-Muwahhideen” (The calamity of the infidels and the advise of the monotheists) of Al-‘Ala Al-Bukhari. 34) “Fath An-Nabi fi Ar-Rad ‘ala ibn Sab’in wa Ibn ‘Arabi” (The informing opening in refuting ibn Sab’in and ibn ‘Arabi) of Al-Bisati Ash-Shafi’i. 35) “Kashf Al-Ghita ‘an Haqaiq At-Tawhid wa Aqaid Al-Muwahideen wa Zikr Aimah Al-Ash’arriyn wa man khalafahum minal Mubtadieen wa bayan Haal ibn ‘Arabi wa Atba’ihi Al-Mariqin…” (unveiling the veil from the realities of Tawheed and the beliefs of the Monotheists and the Zikr of Ash’aris Imams and those who oppose them from innovators, and mention of the condition of ibn ‘Arabi and his followers exiting (the religion)…” of Al-Ahdal Ash-Shafi’i. 36) “Qaseedah fi Al-Hath ‘alal ‘Ilm…” (Poem in exhorting to knowledge) of Al-Ahdal Ash-Shafi’i. 37) “Sharh Qaseedah fi Al-Hath ‘alal ‘Ilm…” of Al-Ahdal Ash-Shafi’i. 38) “Ar-Rasail Al-Mardhiyah fi Nusrah Madhab Al-Ash’ariyah wa Bayan Fasad Madhab Al-Hashawiyah” (The satisfied epistles in assisiting the Ash’ari Madhab and expose of the corruption of the Amdhab of Hashawiyah) of Al-Ahdal Ash-Shafi’i. 39) “Ar-Rad ‘ala ibn ‘Arabi” (refutation of ibn ‘Arabi) of Siraj Ar-Rumi Al-Hanafi. 40) “Hujjah As-Safarah Al-Bararah ‘ala Mubtadi’ah Al-Fajarah Al-Kafarah” (The proof of the shining and pious upon the corrupt and disbeliver innovators) of Al-Kazruni Ash-Shafi’i. 41) Poem of 140 lines of ibn Al-Hamsi Ash-Shafi’i against ibn ‘Arabi. 42) “Ar-Rad ‘ala ibn ‘Arabi” (refutation of ibn ‘Arabi) of Muhammad ibn Muhammad Ash-Shafi’i, Imam of Al-Kamiliyah. 43) Booklet of Muhammad ibn Muhammad Ash-Shafi’i, Imam of Al-Kamiliyah, against ibn ‘Arabi. 44) “Tanbih Al-Ghabee ‘ala Takfeer ibn ‘Arabi” (alerting the idiot on the Takfeer of ibn ‘Arabi) of Al-Baqa’i Ash-Shafi’i. 45) “Sawab Al-Jawab” (correctness of the answer) of Al-Baqa’i Ash-Shafi’i. 46) “Tahdeem Al-Arkan” (demolition of the pillars) of Al-Baqa’i Ash-Shafi’i. 47) “Al-Qawl Al-Munbi ‘An Tarjamah ibn ‘Arabi” (the informative speech in the mention of ibn ‘Arabi) of As-Sakhawi Ash-Shafi’i. 49) “Muntakhab min Al-Qawl Al-Munbi” (selection from Al-Qawl Al-Munbi (of As-Sakahwi)) of Ibn Fahd Al-Makki. 51) “Tasfeeh Al-Ghabee fi Takfeer ibn ‘Arabi” (declaring stupid the idiot in the Takfeer of ibn ‘Arabi) of Ibrahim Al-Halabi Al-Hanafi. 52) “Durat Al-Muwahhieen wa Riddah At-Mulhideen” (The pearl of the people of Tawheed and the apostasy of the infidels) of Ibrahim Al-Halabi Al-Hanafi. 53) “Ni’mah Az-Zaree’ah fi Nusrat ash-Sharee’ah” (The blessing of the means in giving victory to the Sharee’ah) of Ibrahim Al-Halabi Al-Hanafi. 56) “Haqiqah At-Tawheed fi Rad ‘Ala ibn ‘Arabi” (the reality of Monotheism in the refutation of Ibn ‘Arabi)” of ‘Abdullah Al-Himyari. 57) “Furr Al-‘Awn min Mudda’i Eman Fir’awn” (the best of assistance about the claimant of the faith of Pharaoh) of ‘Abdullah Al-Himyari. 58) “Ar-Rad ‘ala Qaailiin bi Wahdatil Wujud” (refutation of the adepts of the creed of unity of existence) of Mulla Ali Al-Qari. 59) “Furr Al-‘Awn miman Yadda’i Eman Fir’awn” (the best of assistance about the one who claims the faith of Pharaoh) of Mulla Ali Al-Qari. 60) “Nateejah At-Tawfeeq wal ‘Awn fi Rad ‘ala Qaailin bi Sihati Iman Fir’awn” (the consequence of success and assistance in refuting those who clain the correctness of the faith of pharaoh) of Badran ibn Ahmad Al-Khaleeli. 61) “Fath Al-Wadud fi Takalum fi Masalah Al-‘Ayniyah wa Wahdatil Wujud” (opening of Al-Wadud (loving One, name of Allah) in the topic of the identity and the creed of the unity of existence) of Muhammad Hayat As-Sindhi. 62) “Al-‘Awn fi Kashf Haal Pharaoh” (the assistance in unveiling the condition of Pharaoh) of Muhammad Hayat As-Sindhi. 63) “As-Sawarim Al-Hidad Al-Qati’ah li ‘Alaiq Maqalat Arbab Al-Ittihad” (The mourning swords cutting the basis of the sayings of the people of Ittihad) of Ash-Shawkani. 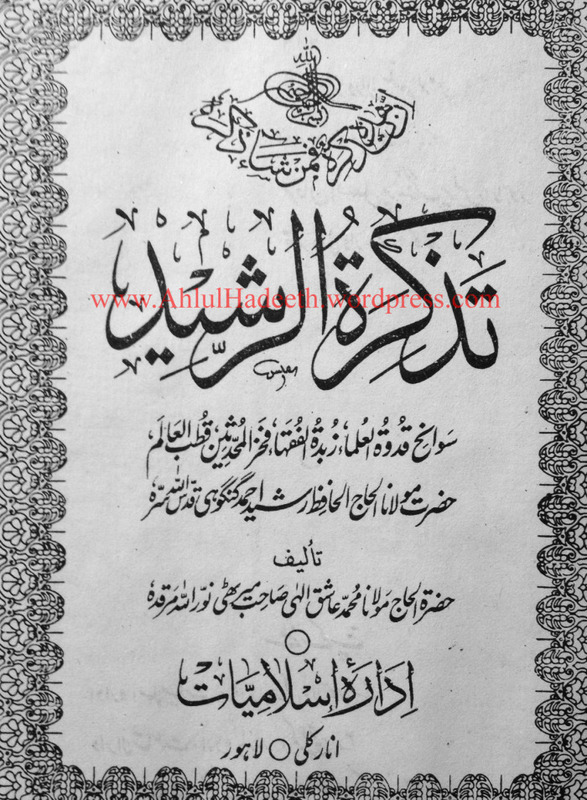 64) “Sharh As-Sayid ‘Arif ‘ala Risalah ibn Al-Kamal fi Tanzih ibn ‘Arabi” of As-Sayid ‘arif Muhammad ibn Fadlillah Al-Husayni. And these are books especially written against ibn ‘Arabi, else many other scholars refuted ibn ‘Arabi in their books of Tafseer, history and others.